Trekking Turkmenistan | Untamed Borders - Adventure travel..
Often referred to as the ‘North Korea of Central Asia’ and being at the crossroads of various civilisations for centuries, Turkmenistan has a multitude of historical, cultural and natural sites to discover. Our 14 day trek in Turkmenistan takes you to some lesser-known spots, exploring the central, southern and western part of the country, including a 4 day trek through a remote mountain range. Trek 60km through the Kopet Dag Mountains bordering Iran. Visit the iconic Darvaza gas crater. Explorer the Mars-like landscape of Yangykala Canyon and the Garabogaz gulf region near the Kazakhstan border. You will be collected from Ashgabat’s airport early in the morning and transferred to the hotel. After breakfast you can head out with your guide to explore Ashgabat. You could visit the Independence Park and Monument, Arch of Neutrality, National Museum, Old Nissa fortress, Tolkuchka Bazaar, and some other quirky sites of modern Ashgabat. There are numerous museums to Turkmenbashi and the Turkmen people. It just depends on how much personality cult you can handle. After breakfast you will drive 188km west towards Nohur, which is located in the Kopet Dag Mountains and known for its sacred places connected to the Persian legend of the winged spirits of Peri. En-route you’ll stop at the Geokdepe stud farm which is home to the pure blooded Turkmen-Akhalteke horse (Turkmen’s national emblem), Saparmurat Haji mosque and a chance to swim in Koy Ata’s underground lake and hot springs. In the afternoon we’ll arrive in Nohur where you can relax in this small mountain village and visit Kyz Bibi, a local shrine. From Nohur we’ll drive a short distance to the village of Kunya-Kumbez, the starting point of your trek. Over the next four days you will walk over 60km through picturesque gorges, ravines and mountain ridges near the Iranian border to reach the village of Koshdemir on Day 6. After breakfast we’ll leave our camp in Koshdemir a drive 370km to Balkanabat via the Sumbar river valley. You will stop off at Kara-Kala’s lunar-like landscape which is within a nature reserve and home to the protected Persian leopard. Before reaching Balkanabat you can also explore a couple of 13-14th Century mausoleums. Balkanabat is at the foot of the Balkan Daglary mountain range and a well-placed starting point for exploring western Turkmenistan. After breakfast you’ll head to the canyons around Yangysuw and the Garabogaz gulf area near the Caspian Sea. Depending on water levels, you will be able to see the waters of the gulf in the distance which is the world’s largest salt lagoon, more briny than the Dead Sea. In the afternoon you’ll drive to Yangykala Canyons which offers up some of the most impressive desert views in Central Asia. A full day 250km drive to Northern Bogdakshor heading east into the Kara Kum Desert via Gozli Ata’s 12th Century Sufi graveyard and unique volcanic rock formations in Kemal Ata. Bogdakshor is nicknamed ‘Balls Canyon’ because of its unusual Mars-like landscape featuring wind-sculpted balls of rock. From Bogdakshor another 250km of driving through the desert (via Geokdere and Melekoch Village) will see you reach the more than 2000 year old Parthian fortress of Igdy Kala perched above the Uzboy River. After 300km of driving, passing by the villages of Davali, Charly, and Atakuvi, you will reach the iconic gas crater of Darvaza which has been burning continuously since 1971 after Soviet engineers set it alight due to concerns of poisonous gases infiltrating nearby towns. After breakfast in your campsite you’ll drive to the desert village of Damla (via Erbent). 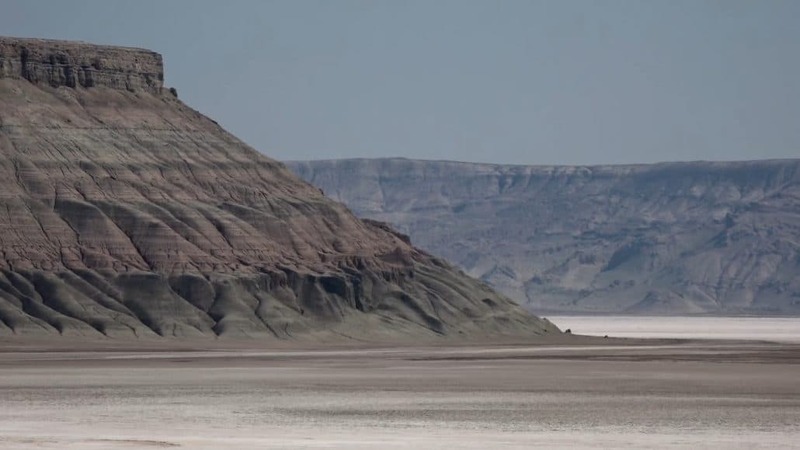 Along the way you can stop and take photos of the expansive desert landscape and Uzboy – the ancient riverbed of the Oxus. If time and road conditions allow you may also have time to visit two more craters bubbling with natural gas. On arrival in Damla you’ll meet with a local family, have lunch and explore the local area. Overnight in tents or guesthouse. You’ll start the morning off venturing 130km off-road across the desert heading back to Erbent, the largest village in the central Kara Kum Desert. Once you reach the main road there is 280km of driving to reach Ashgabat (with opportunities to stop along the way and take photographs). After breakfast you will be transferred to Ashgabat airport for your departure flight. We do not directly arrange international flights. You can also contact the Untamed Borders dedicated team at Flight Centre for suggested routes. We will provide the letter of invitation for the Turkmenistan visa so you can obtain it on arrival at Ashgabat airport. In-country registration of your passport/visa is also included. Ensure you have up to USD$120 in cash to pay for your Turkmenistan visa when you arrive. The price can vary, however it will be USD$40-90 for the visa & arrival tax, plus USD$10-15 for the migration card. Our trekking trips are designed to be physically engaging and provide a level of challenge for most people. As a general guideline for all of our trekking trips, we recommend that you have some prior experience walking with a 10-15kg day pack for up to 8 hours over 5 or more days through uneven & varied terrain (and weather); ranging from hard-packed earth, tussock grass, boulder fields, scree slopes, soft snow patches, and knee-deep rivers. Breakfast is included each day, as well as lunch and dinner (unless stated otherwise in our exclusions above). The accommodation will be based on you having your own room if you are traveling alone or a shared room if you are traveling in a group. Transport will be in an air-conditioned car wherever possible. You will be accompanied by local guides and an international trekking guide from Untamed Borders.